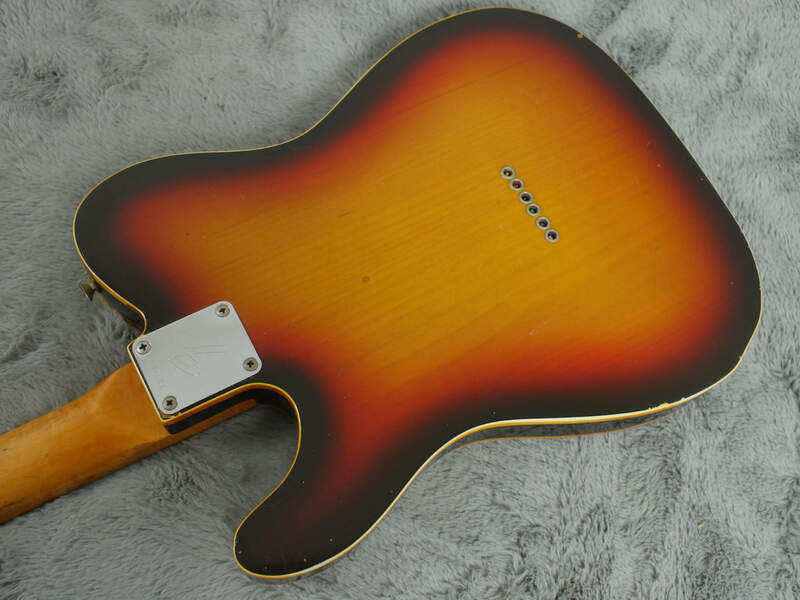 If you are looking for a museum piece then this is probably not the Custom Telecaster you have been looking for. 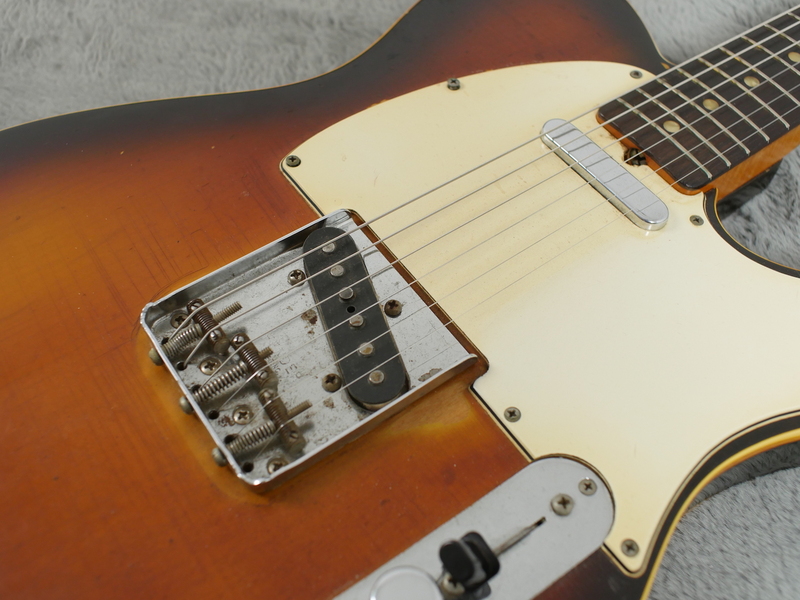 If however you are looking for an all straight, no nonsense playing machine with no modifications or repairs and do not mind a hint of patina brought upon by countless gigs in smokey bars then this definitely could be for you. 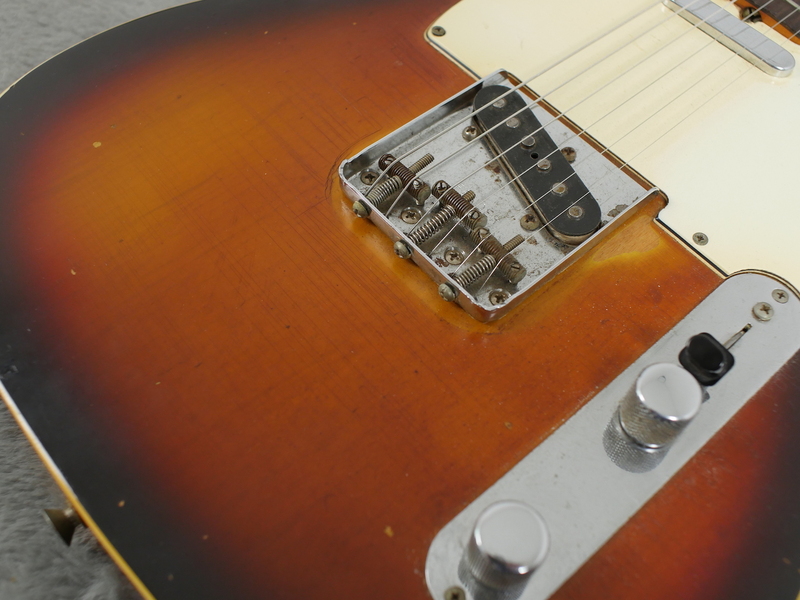 Rare to see survivors from the late 60’s like this but this one has lasted the last 50 years without any modifications or repairs whatsoever. 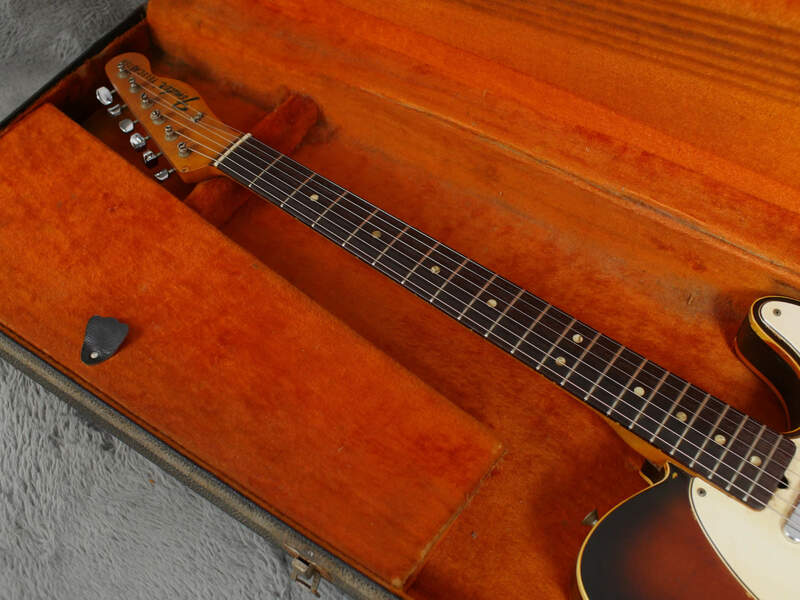 It was just accepted for what a great guitar is is and someone got on with the task of gigging it, quite a bit, in what appears to be some real smokey, downtown bars… Have a look at the pictures and you will see what I am referring to. 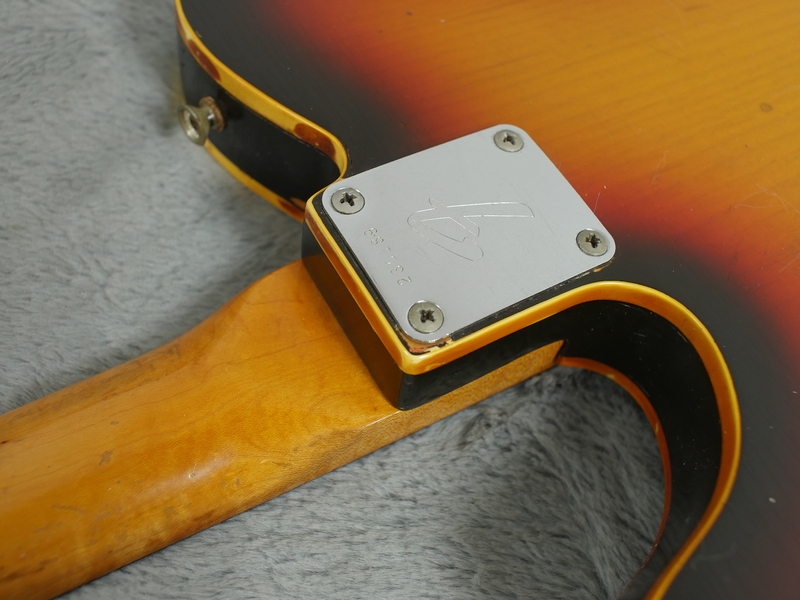 Why fix anything that is not broke? 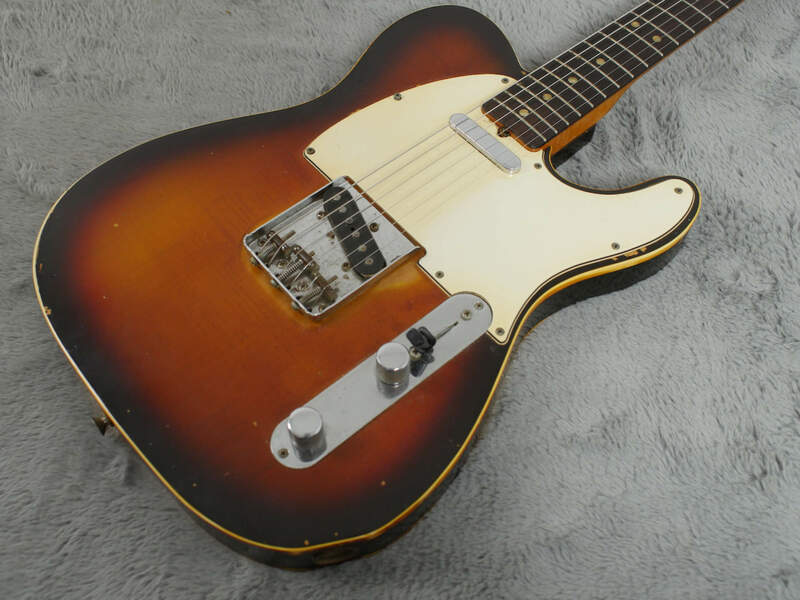 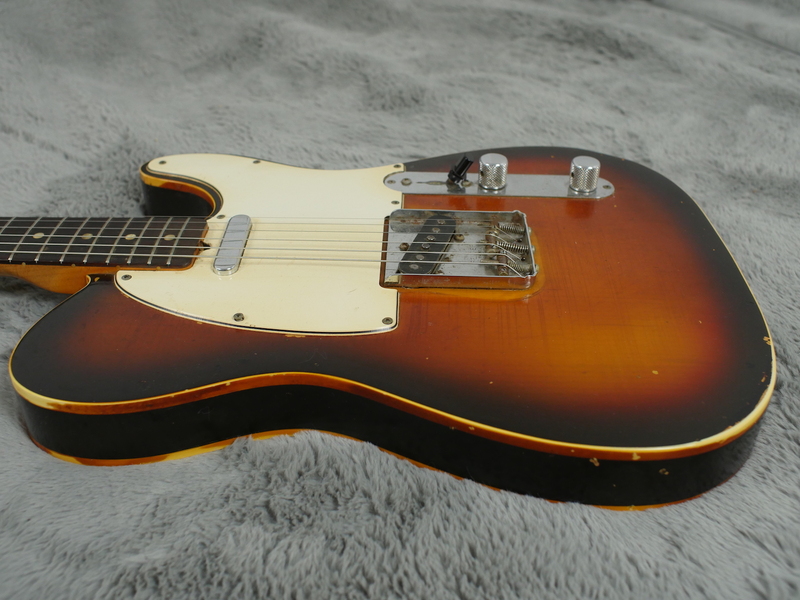 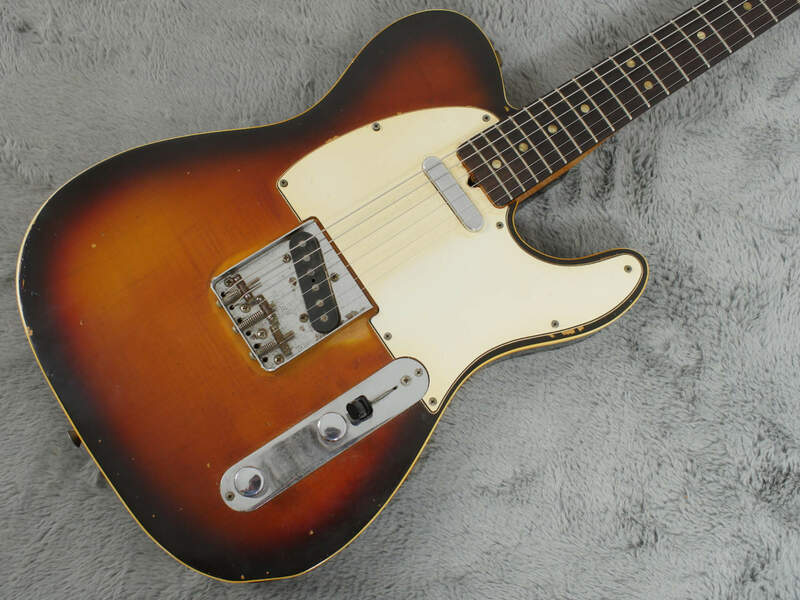 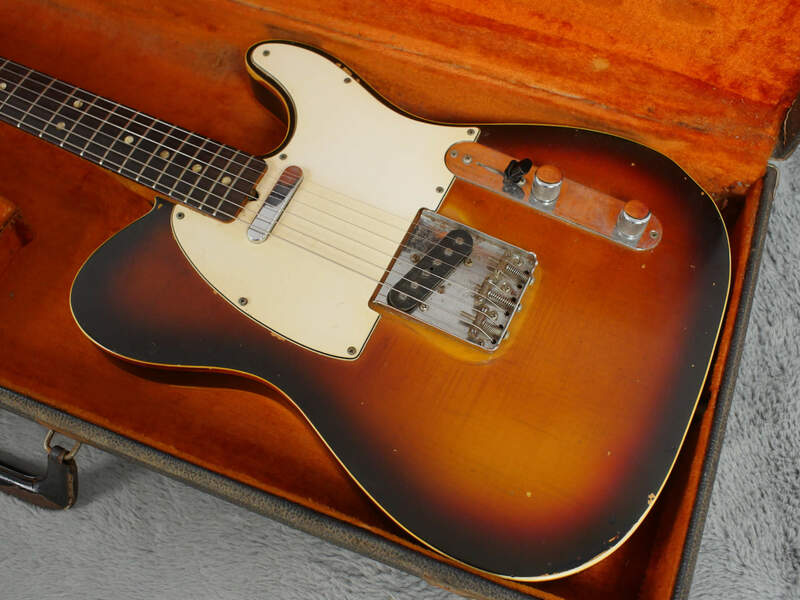 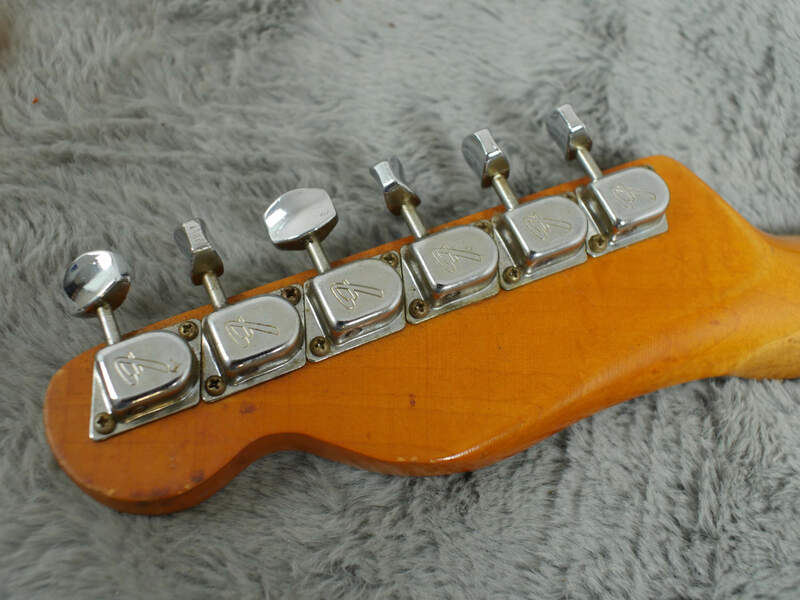 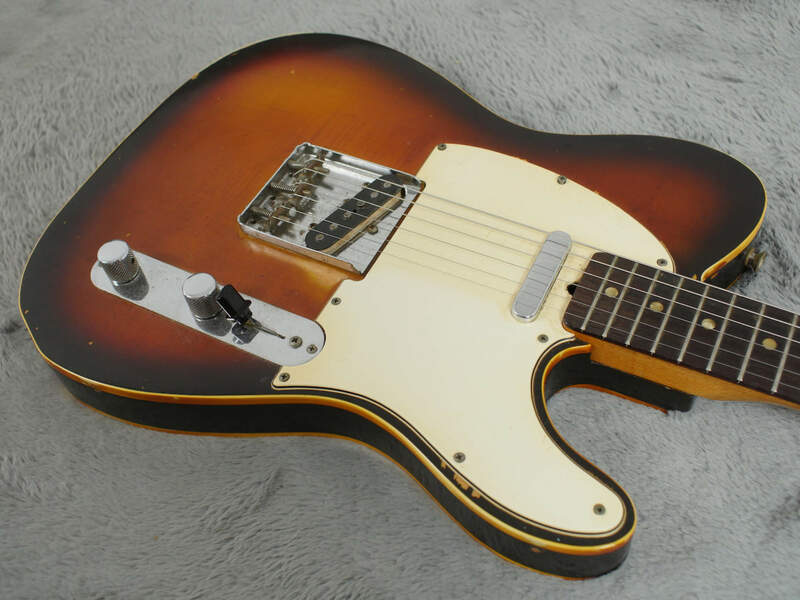 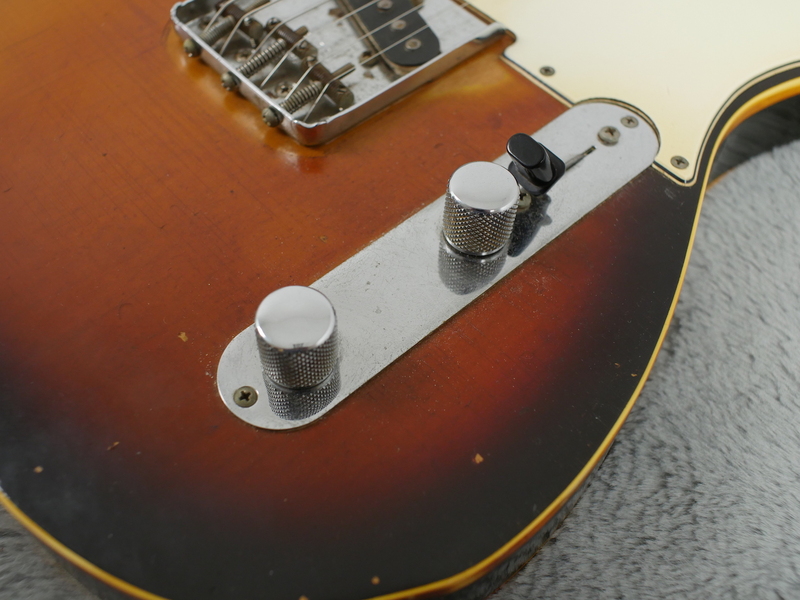 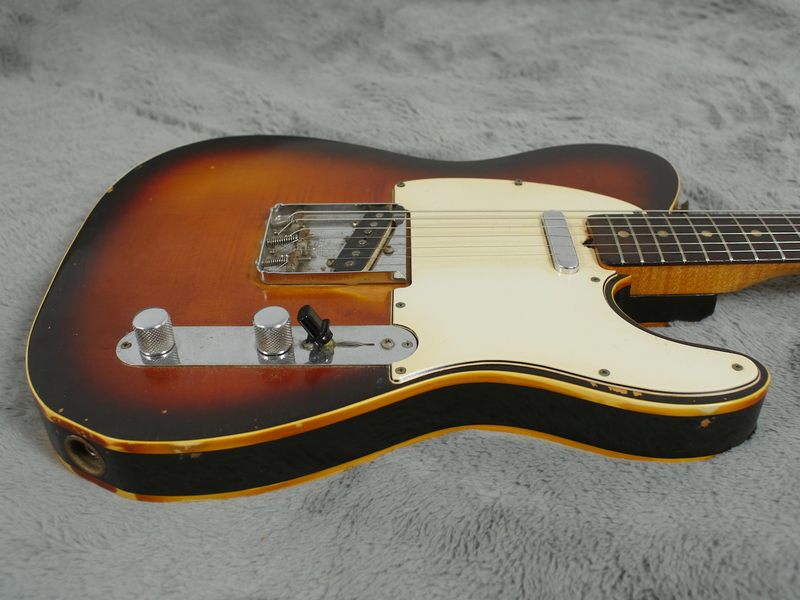 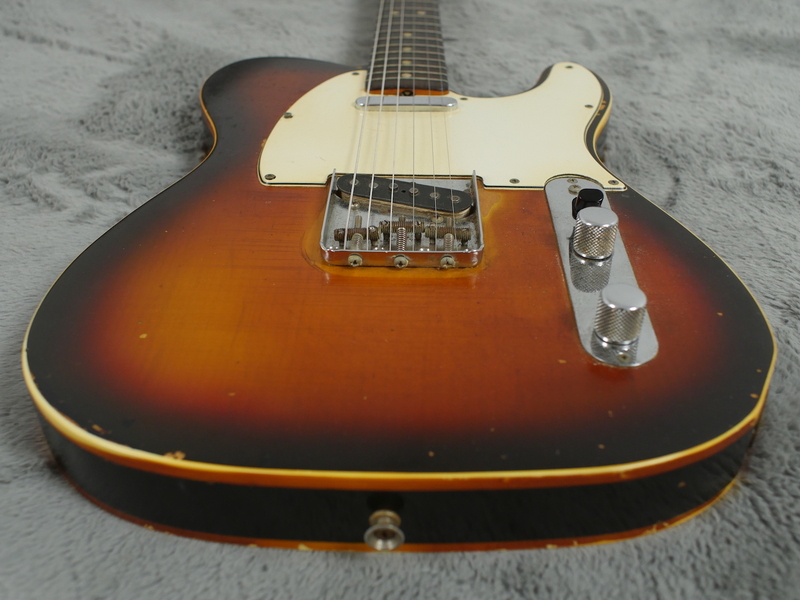 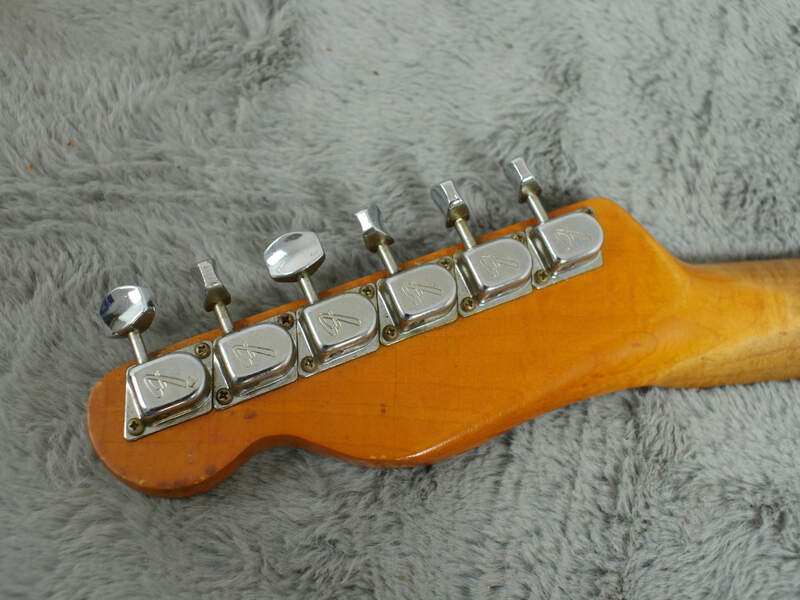 The Tele was a brilliant guitar straight out of the box and by the time 1968 was upon us Fender had finally got rid of that woof tone circuit and the sound of the neck pickup opened up as perfect partner to that Tele bridge pickup bite. 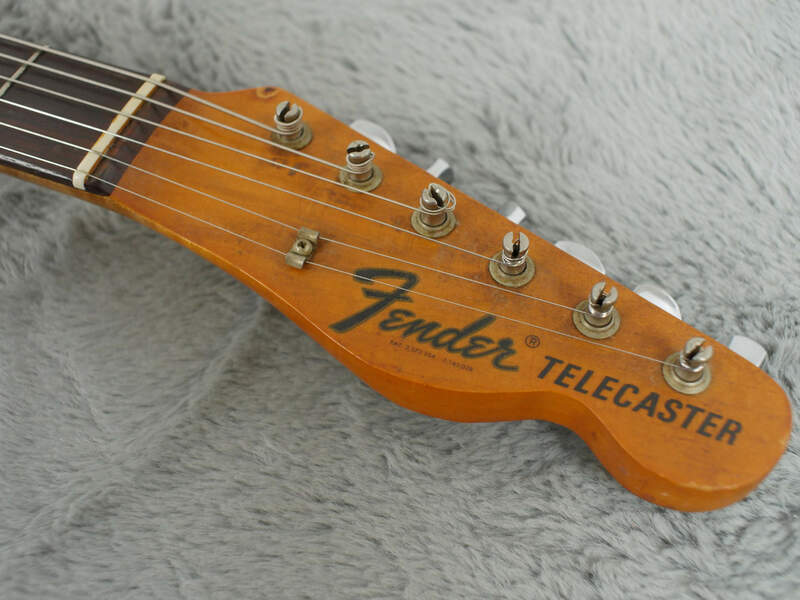 We had an original Broadcaster here for a short while a few weeks ago and it was most satisfying to hear the neck pickup of that with no tone cap across it, although 1968 Tele circuits do have tone caps, it still opens that pickup up compared to the Tele circuits of just one year earlier where you couldn’t dial it out. 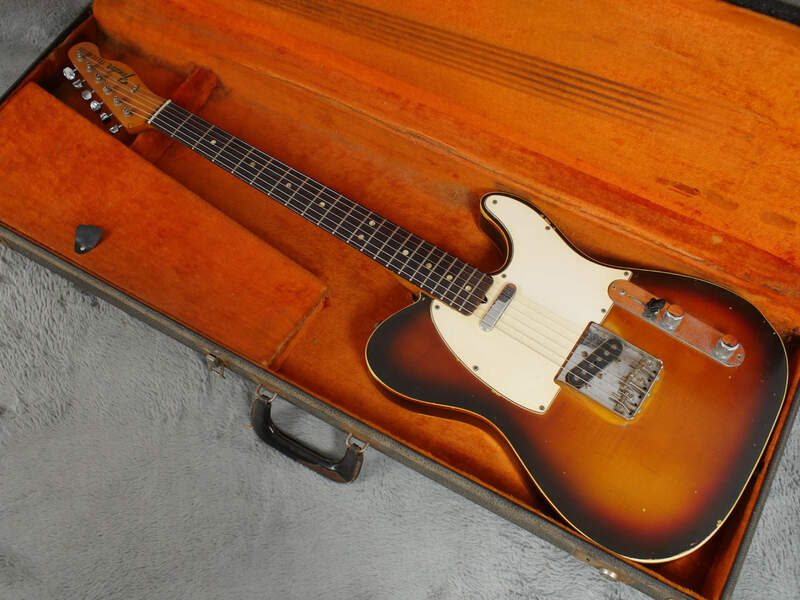 Back to this guitar. 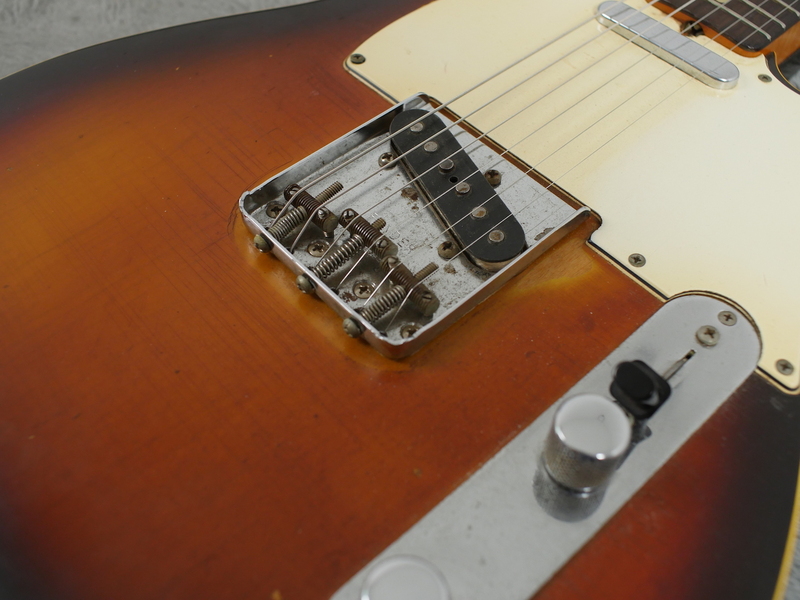 Plays well with strong sounds from both pickups. 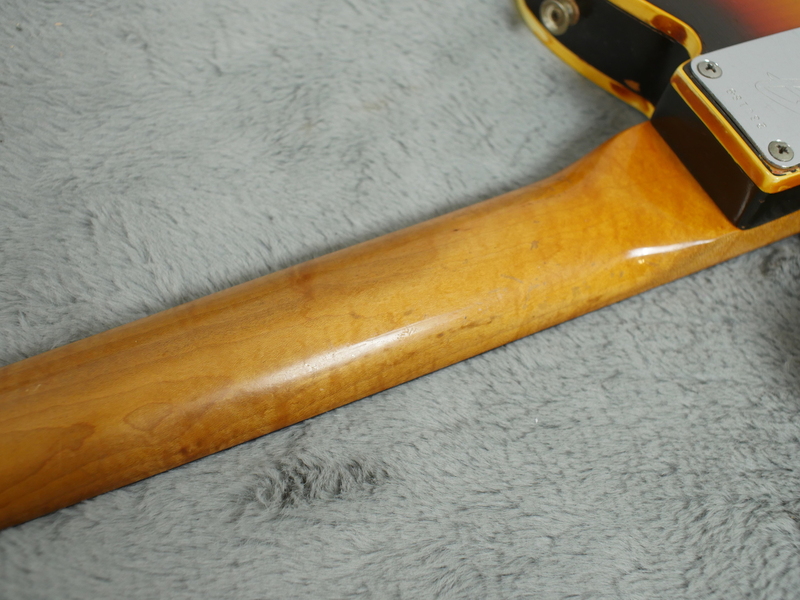 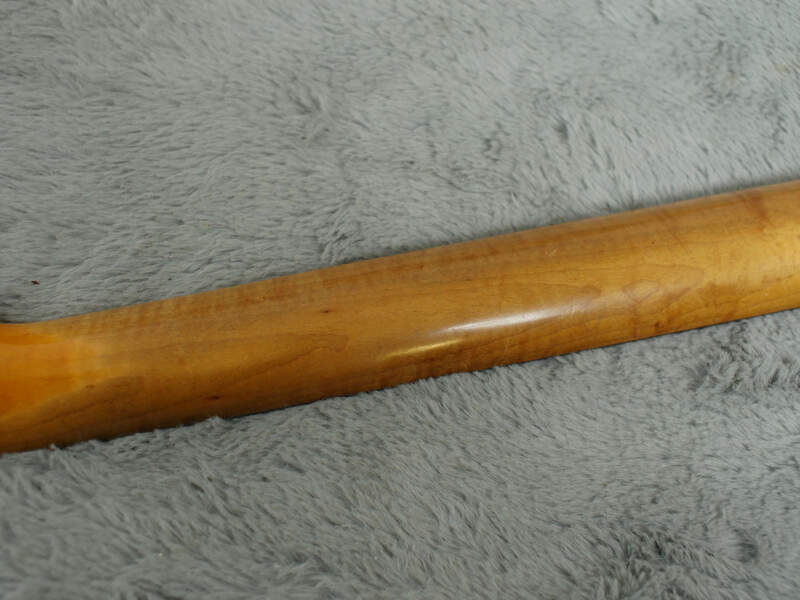 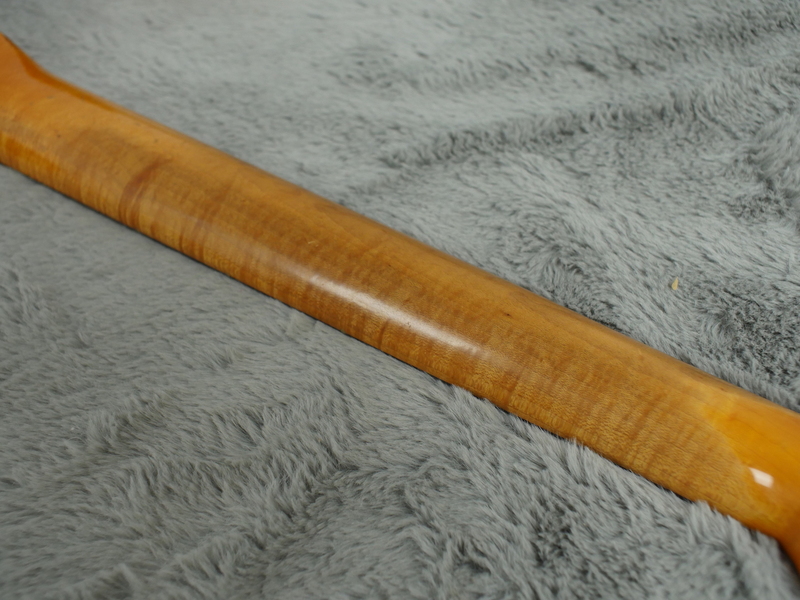 Finish is heavily nicotine stained as you can see. 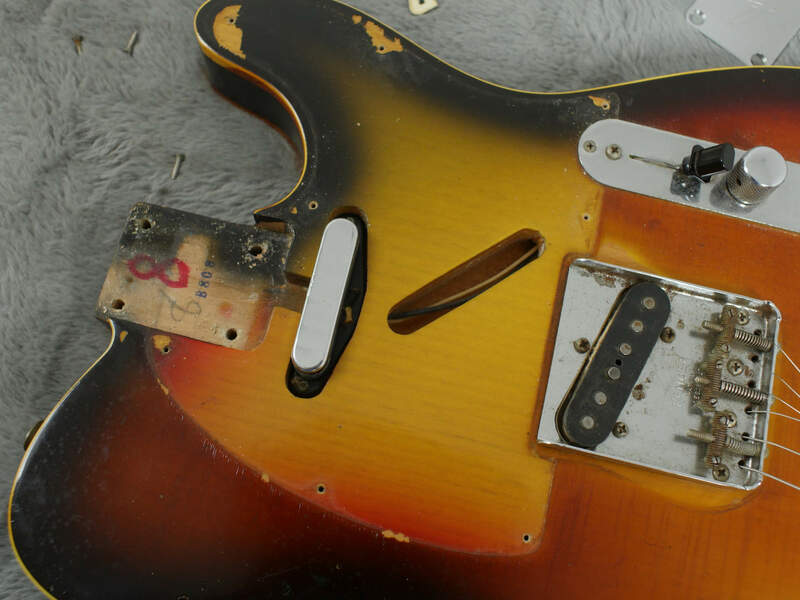 You can probably clean this off, quite a fair bit actually, but we have left it on as don’t you think it is part of the guitars history..? 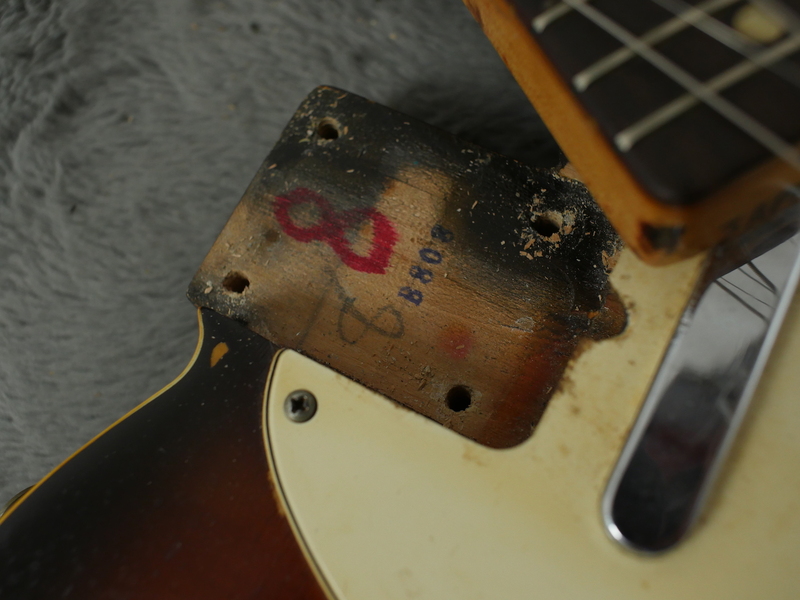 As you can see under the guard it is un faded and this is what it would have looked like when new. 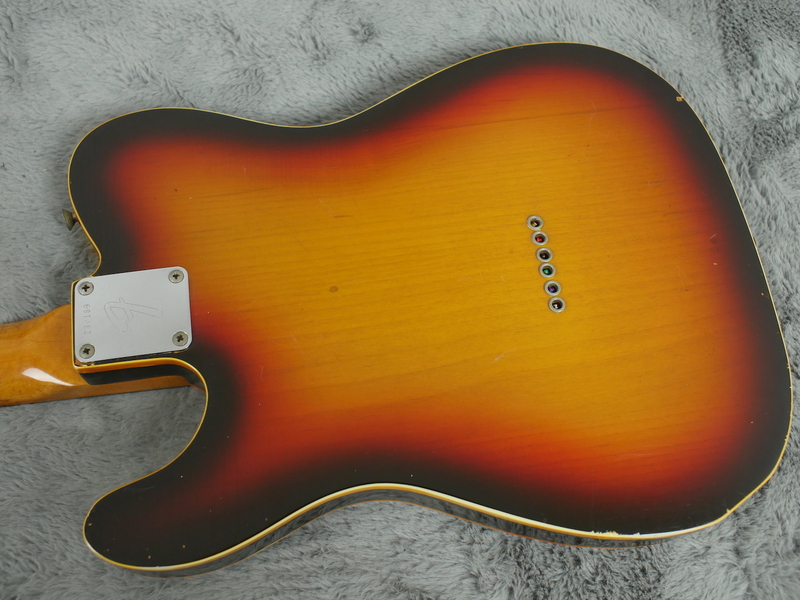 Back of the neck (which by the way feels very smooth) has a decent amount of flame on it and in fact does look very pretty. 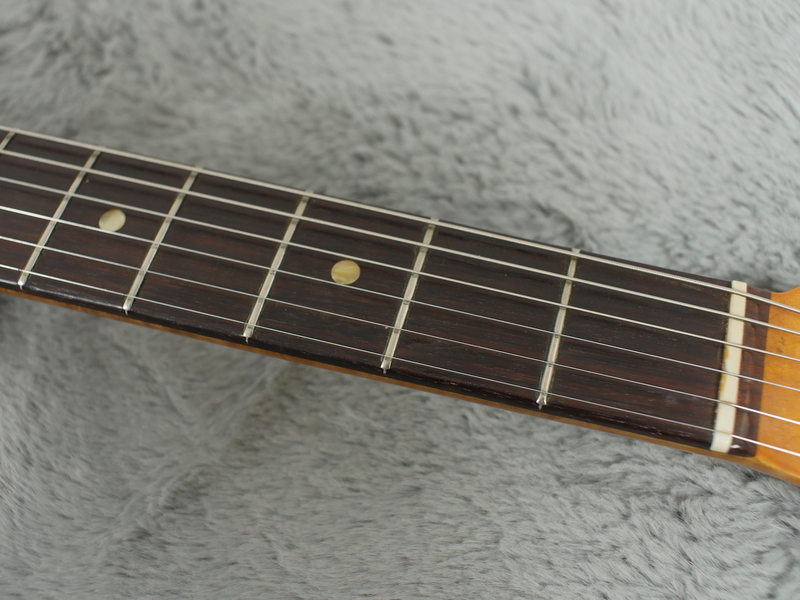 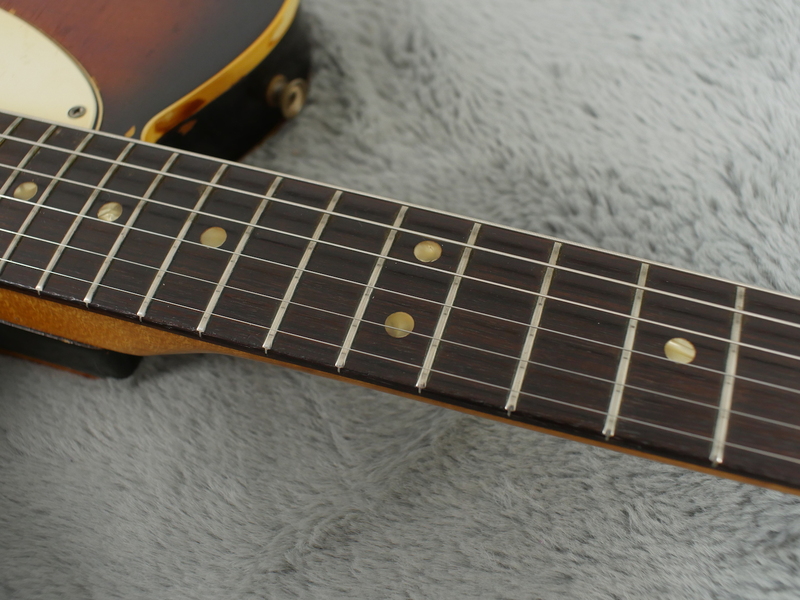 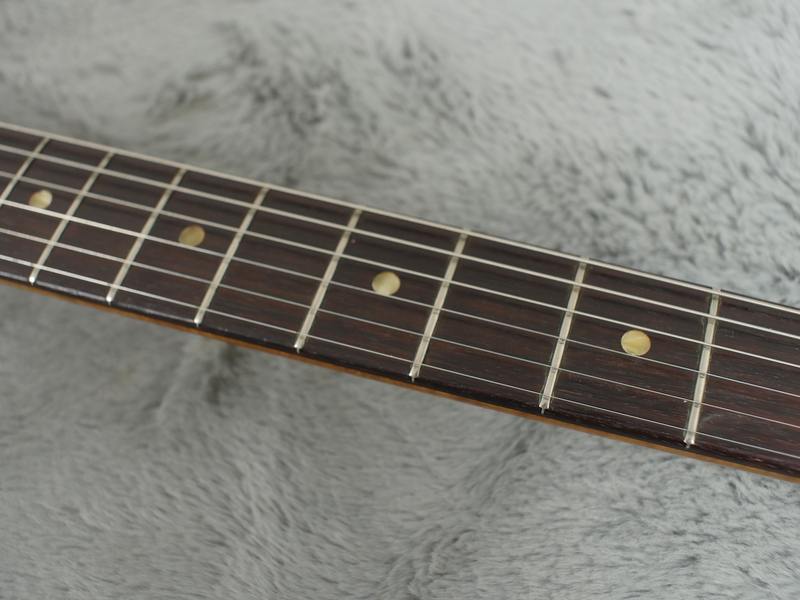 Original frets have some life left on them and most people will be able to play them with not too much problem. 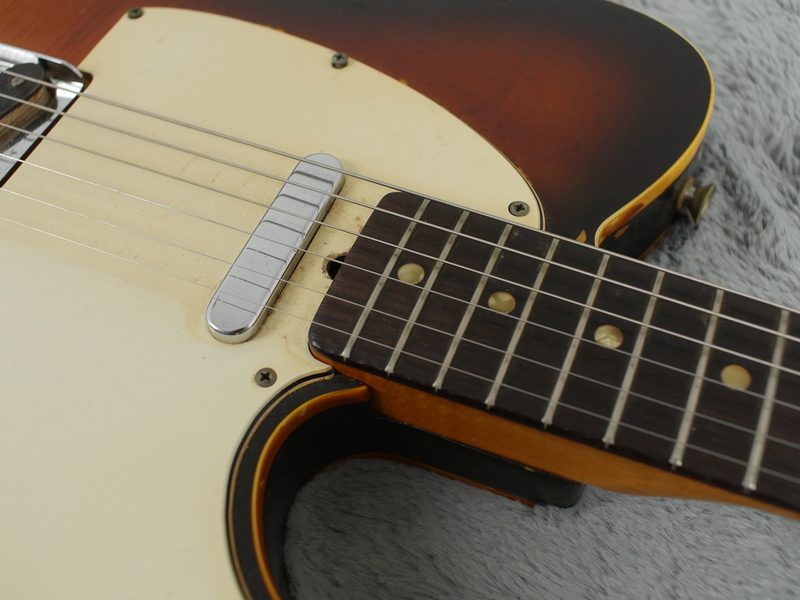 Pickups sound brilliant - classic Tele bite without being too shrill. 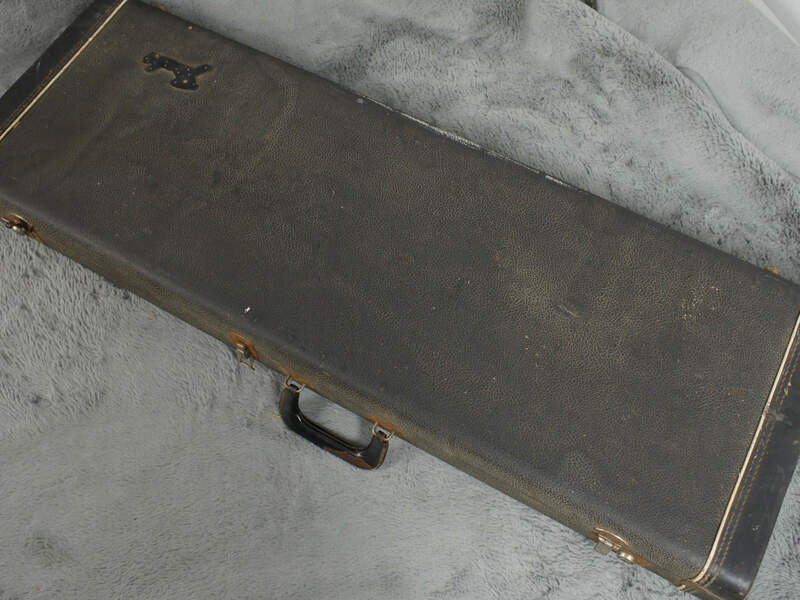 Nice weight at 3.5Kg and correct case is in very good shape but as usual for this period does have most of the logo missing. 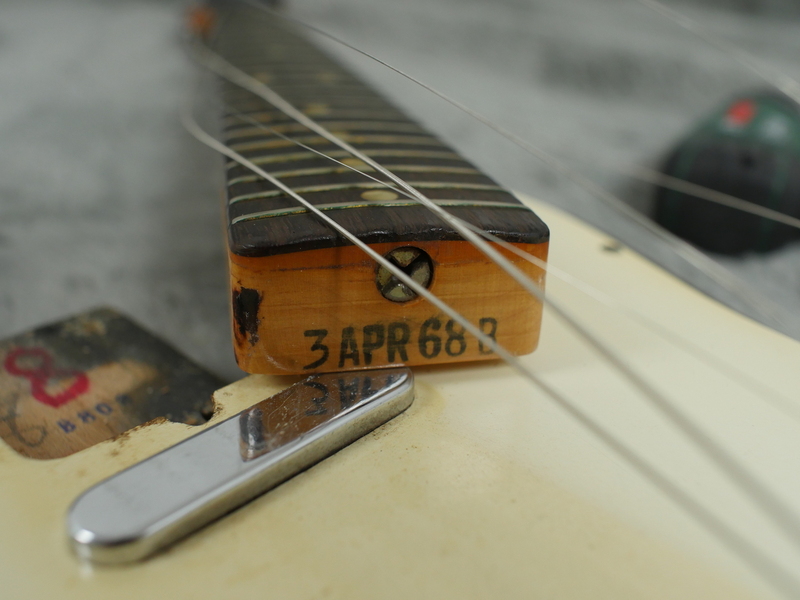 No ash tray cover I’m afraid, no idea what happened to that, but as you can tell from the patina it has obviously been played for some time with that cover still on! 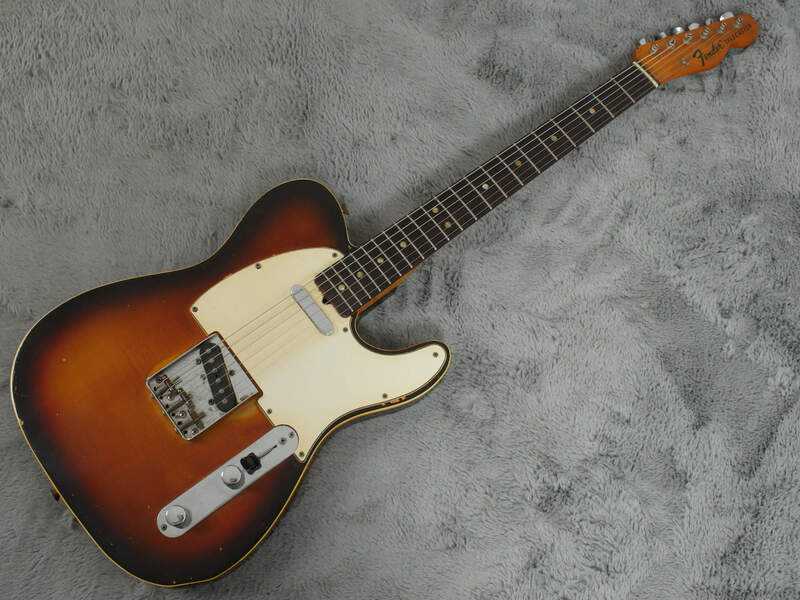 Our opinion - a very cool guitar that you can take out and rock, twang or strum to your hearts content, anywhere you like and not worry about a few dings or dongs..